Melissa C. Molina is the Administrative Assistant to the Dean of the Dreeben School of Education. 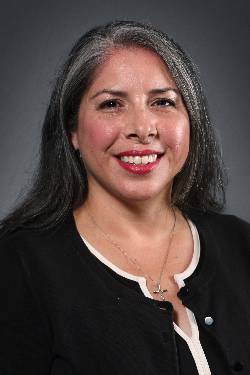 She has been with the University of the Incarnate Word since April 2016 and in Higher Education since 2011. Prior to joining UIW, she was at Texas A&M University-San Antonio as the Executive Assistant to the Chief of Staff and Vice President for Strategic Initiatives and Military Affairs. She works closely with faculty, administrators, staff, and the community with communication to the Dean. Melissa assists students with the management of grievance claims, supports faculty with meetings, and departmental events. In addition, she coordinates departmental correspondence, distribution of information, and works with department leaders on the yearly academic schedule. Other responsibilities include supervision of Federal Work Study employees and to facilitate the onboard of new employees to the department. Melissa is currently working on her Bachelor of Arts in Applied Science and will be graduating in December 2018. She has earned two Associate of Applied Science degrees in Office Systems Specialist and Records Management. In May 2014, she became a Certified Administrative Professional. In her spare time when she is not studying, she enjoys spending time with her family and dog Ginger, running, and cooking.